What is #TryingStuff to you? When I got a mysterious box in the mail with an #OmniTen label on it back in the spring of 2012, I had no idea what to expect. Heck, I didn’t even know what “#OmniTen meant. All I knew was I’d been chosen to be a part of a team of ten passionate outdoors folk who are influential about adventure in the social media realm, and that I’d have the inside scoop on some of Columbia’s newest gear. 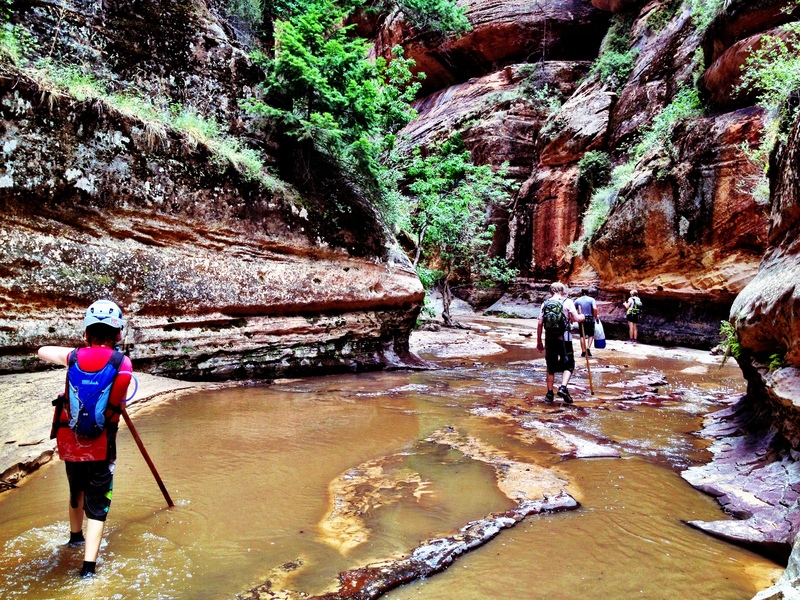 I didn’t know being part of the #OmniTen would send me into the mountains around Sedona, deep into the Grand Canyon, along trails to stunning waterfalls, or to Utah to take Columbia’s phrase “#TryingStuff” to a whole new level in the #OmniGames. I didn’t know I’d meet a group of the most adventurous, inspiring people who had the potential to become lifelong friends. To me, a big part of #TryingStuff means opening yourself up to the possibility of finding adventure, inspiration, friendship, and meaning in new and unexpected places. To me, #TryingStuff is taking your experience to a whole new level. Breaking out of the cookie cutter mold your life has so long since been apart of, and getting outside, getting anywhere and experiencing life. 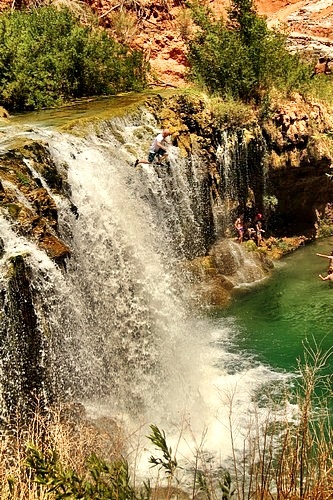 See new places, explore something you never would’ve thought you would do before. Step outside the box, even if for just a minute, you will never regret #TryingStuff, even if it doen’t always have the results you were hoping for, just begin Trying more. Life is an adventure, experience it. 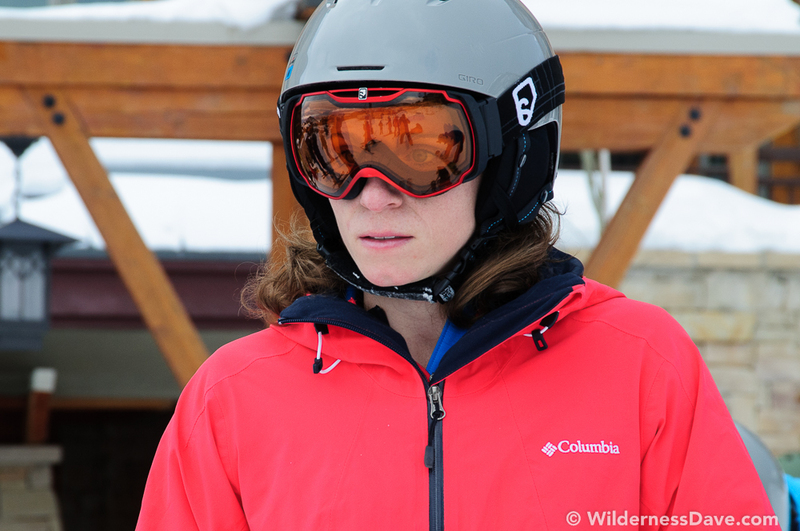 #TryingStuff means taking risks. It’s walking a tightrope 55 feet off the ground when you’re terrified. It’s flying thousands of miles from home and not sleeping for 36 hours to spend four days with a big group of people you’ve never met. It’s sharing incredibly personal struggles and stories with the world. It’s being inspired to travel the world. It’s moving to a new state to chase your dreams. It’s being willing to grow, even when you’re not sure what that growth looks like. 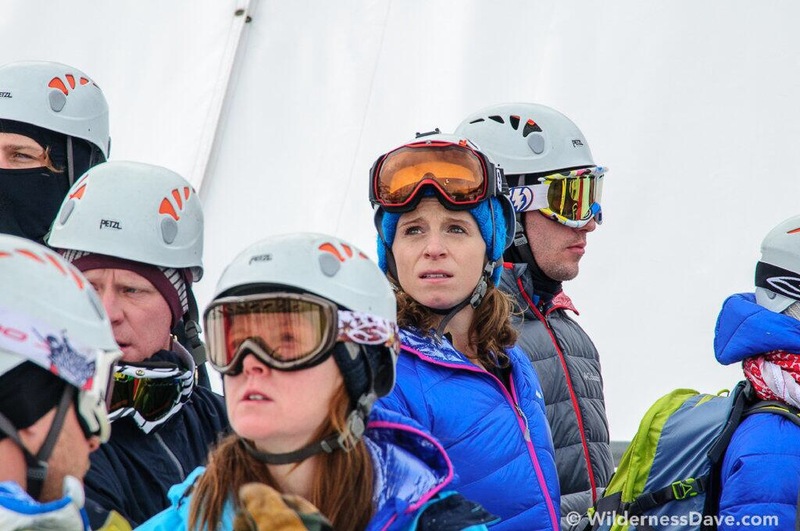 #TryingStuff is a lifestyle, and that lifestyle is a big part of what made the #OmniTen and the #OmniGames such a success. “Innovation” is defined as “the act or process of introducing new ideas, devices, or methods,” and Columbia’s been innovating for nearly a century. 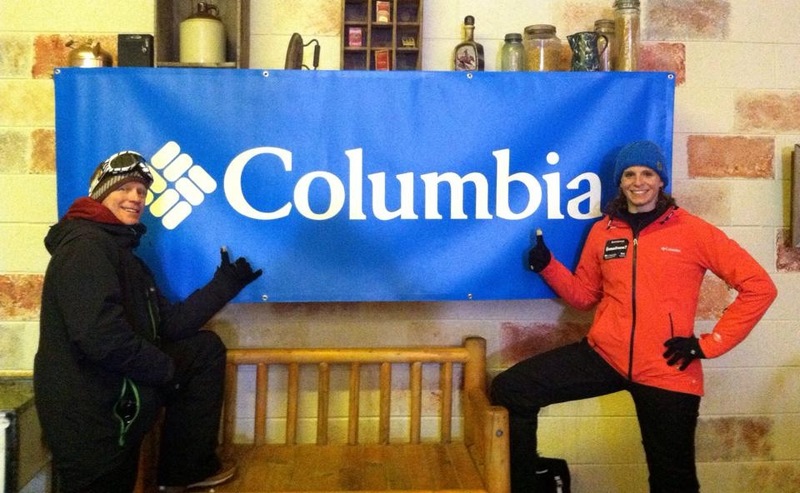 Originally dubbed the Columbia Hat Company, The Columbia Sportswear we know today is what it is as a result of a #TryingStuff mentality. From being the first to introduce the Gore-Tex™ parka in 1975 to creating a technology that makes it possible for clothing to cool you off, Columbia continues to push the envelope with respect to innovation in gear and apparel. Not all of the gear is perfect, but some of what I’ve seen over the past two years has absolutely blown me away. 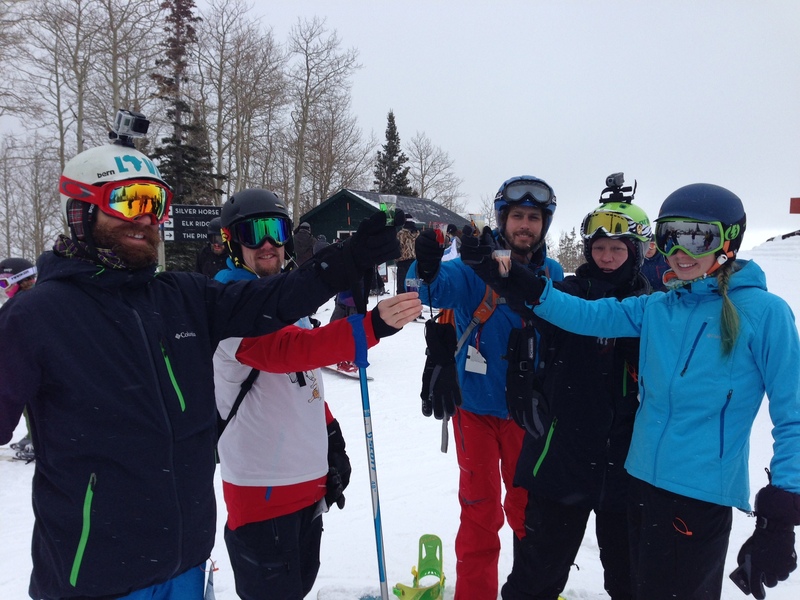 The best part of #TryingStuff is the connections you make doing it. 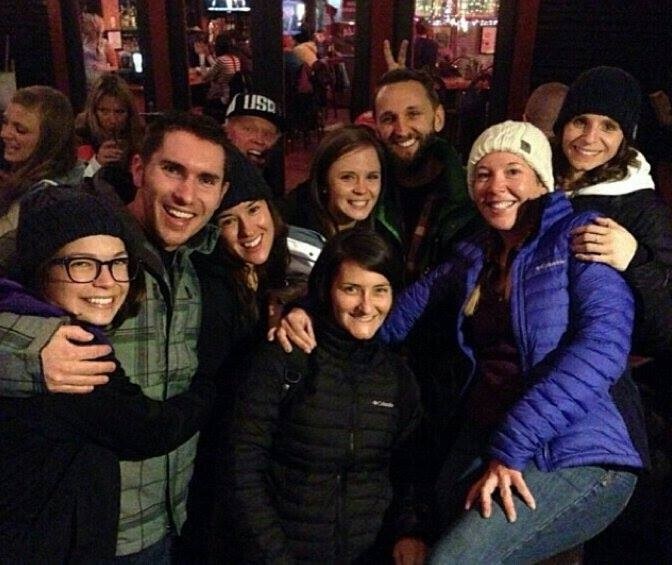 Since I’ve really put myself out in the open #TryingStuff, I’ve met a whole range of new life long friends. 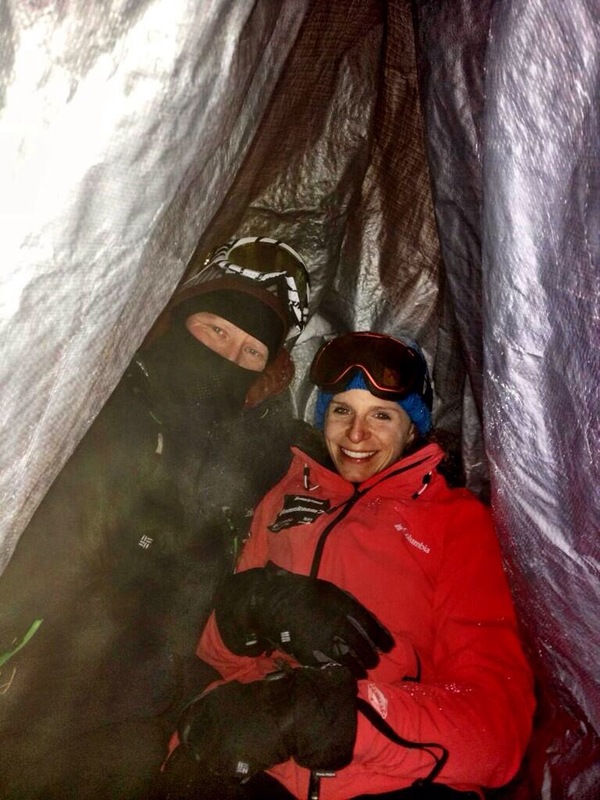 Someone who designs tents and packs, a single mom who climbs off-widths… with her kids. A girl who lives in her car traveling North America and writing about it. Someone who moved all the way across the country to a remote town in Wyoming. And now a Canadian with a love for life beyond anyone I’ve met. I’ve seen new and interesting places, and experienced life… Even if it’s just been in small doses thus far. 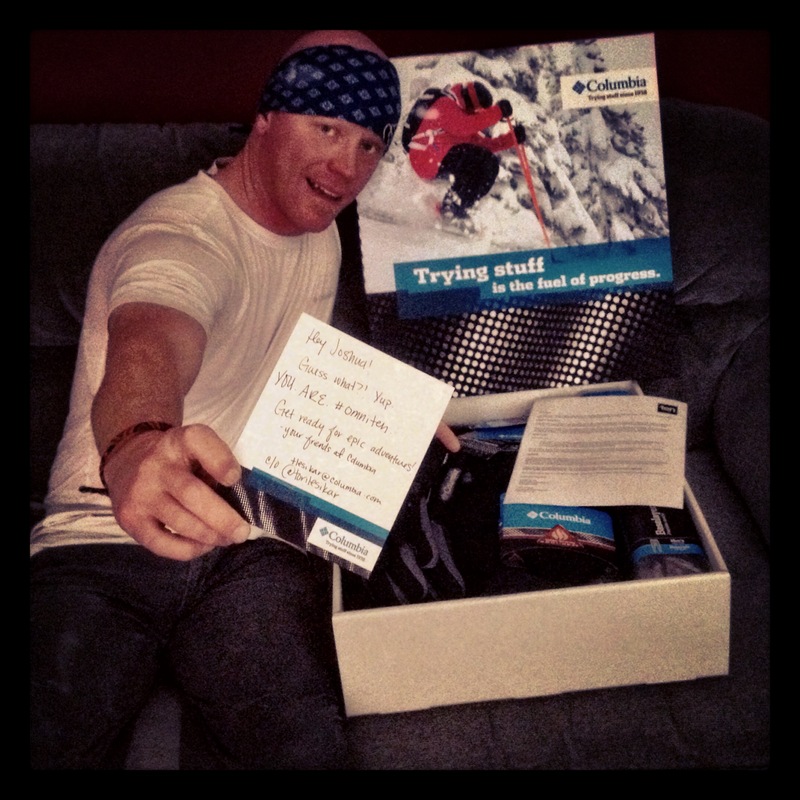 Through out my experiences of #TryingStuff, the one constant is my love for #IntroducingStuff to new people. I love sharing my experiences with others, and bringing them along for the ride. I wouldn’t trade this for anything. 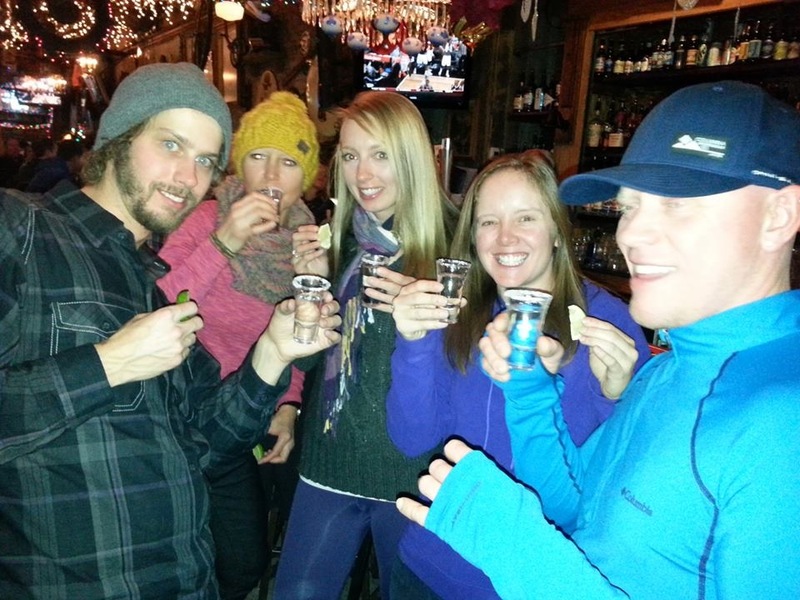 Through #TryingStuff I found my people, I found my place in this world and I live to experience. 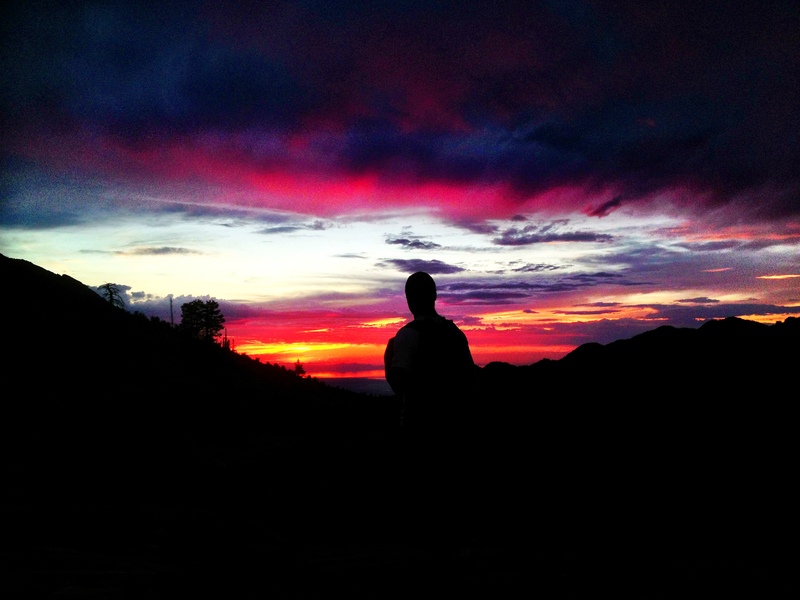 I Experience via my Imagination, and I’m Adventure Inspired… I have dreams, I love my new Omni-family… I am #Omniten! I’d like to say that it was silently snowing outside that morning, like it had been the previous day. But the truth was, the wind was violent. So violent, that we thought the whole might be canceled and the resort would be closed. As Daniel and Tori worked vigorously to figure out what challenges we could still do, we all waited impatiently in anticipation on how the rope course would be, if we got to do it at all. I for one was really excited. It was my time to shine. This was the closest thing to rock climbing, and I wanted to show off my mad skillz. My teammate on the other hand was kind of dreading the whole thing. Katie has a deathly crazy fear of heights. And she was terrified that she was going to have to do the 60′ jump. Secretly, little Katie Boue and I had been trying to feed Daniel and Tori with the idea that there was an indoor rock climbing gym near by. We could all go there, they don’t close do to weather. But it was all for not. Daniel got our attention and explained to us that the jump was off. It was too windy to make the jump, the Leap of Faith challenge had been canceled and we would finish out the #Omnigames with the remaining events. I turned to Katie and saw the awesome glow in her eyes that her worst fear was gone. And almost immediately she started to focus on the 50′ ropes course. We road in the shuttle bus side by side as teammates do, and she told me that she was now really nervous for the ropes courses. As I tried to convince her that she would be ok, I realized I needed to put my own selfish reasons for wanting her to do it aside. She was truly scared. So I looked at her and told her, you don’t have to do anything you’re not comfortable with. If your scared, just stay on the ground and we will see what happens. As much as I wanted to get our best chance to go to Jordan, I absolutely didn’t want to see her terrified up there, or freeze up, or cry. And I could tell, she didn’t want to let me down. Although, I don’t think she knew it wouldn’t be letting me down, I understand the fear of heights more than most. Just because I climb, I had a deathly fear of heights growing up, and it still lingers. In high school I froze on a climbing route and took a 20′ fall landing my side on a huge boulder. I still have a scar. But I also know there is only one way to face those fears. That’s me taking center stage on the high wires. Now Katie is one tough girl, she’s a cross-fit champion, super muscular, strong and athletic. But underneath that physique, I can tell she is all lady. She has no problem telling you when she feels uncomfortable. Not like us guys, how if we are scared or nervous we try to act cool. Play it off with jokes and such. She’s honest with her feelings. It was inside that one task in particular, I felt like I was absolutely needed. As we approached the high ropes, I agreed to stay behind her and go last so I could help talk her through it. Each obstacle (there were like 25) I did my best to calm her down, tell her to focus on her foot work, keep the weight on her feet and breath… Most importantly, breath. And her very dear friend Heather stayed just in front of hr and talked her through it as well. One fall, and the team was out 100 points, so this was a huge event for us. When she finally made it across the last obstacle, she hugged the final log post with a death grip. So happy that she had made it alive, and more happy that she did it without even a flinch of a fall. She ABSOLUTELY crushed that course. Childs play! I felt proud of our team effort in making it across the high ropes course. I knew this girl totally had the strength and ability to do the course, she just needed a little guidance to feel the flow. Sometimes it helps to have someone else show belief in you. It becomes all you need to achieve. And as proud as I was of myself, I felt more pride in how she faced her fears and absolutely destroyed them. Crushing both the high and the low courses with ease. Giving our team some much-needed points to stay in the hunt. The Lookout Below event of the ropes course was really hard, less than half the people who got on the ropes made it through without falling. It played as a key challenge to help many team close the gap. I believe most everybody made it through the Bridge the Gap course. Katie didn’t know this, but the entire time she maneuvered the course, Scott Trepanier was behind me, he wanted to give the course his best go as well. He kept telling me how strong she was, how she could easily crush this thing over all the guys in the group, if she just got out of her head and trusted it. It was in those moments, that I saw what a truly great and family oriented company Columbia was. His encouragement, his motivation, I’ll never forget the way he wanted to see her succeed. Not only was he the man who helped put this entire #Omniten program together, but he is actually a friend to everyone involved. After lunch, the entire group bound up for the final event. I knew we were still not sitting in one of the top 5 spots, and we needed another epic performance by both of us on the Downhill Derby. We were in a race to gain the most vertical elevation in an hour and a half. 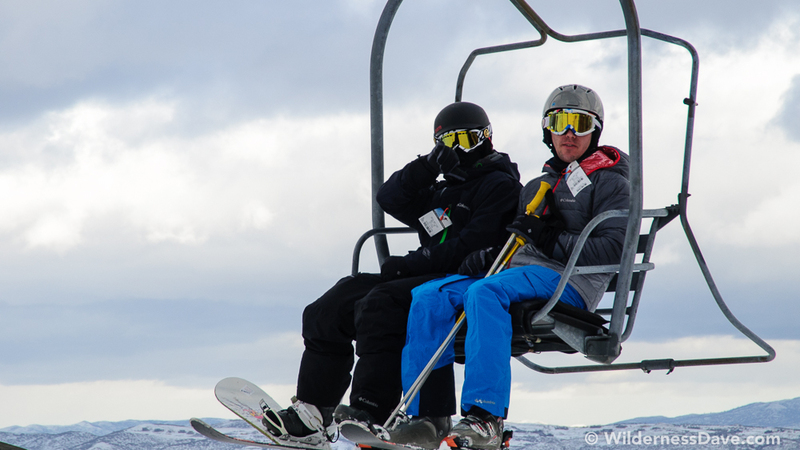 Basically find a line and a lift that will get you up the mountain and down quickly to burn another run. I felt we had a good chance at gaining more ground. 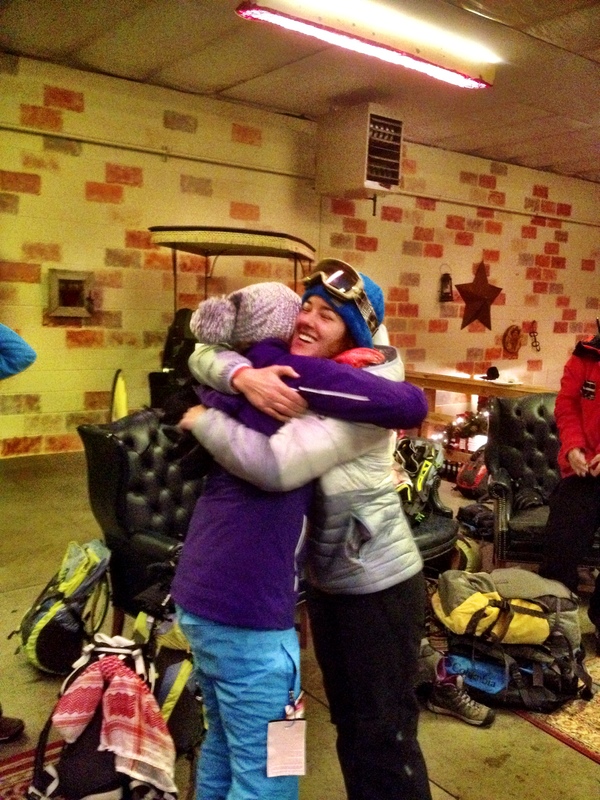 As most the experienced skiers/boarders had beginner partners, Katie and I were both at the intermediate level. And I figured we could both stay within 1-2 runs of most the fastest powder hounds. 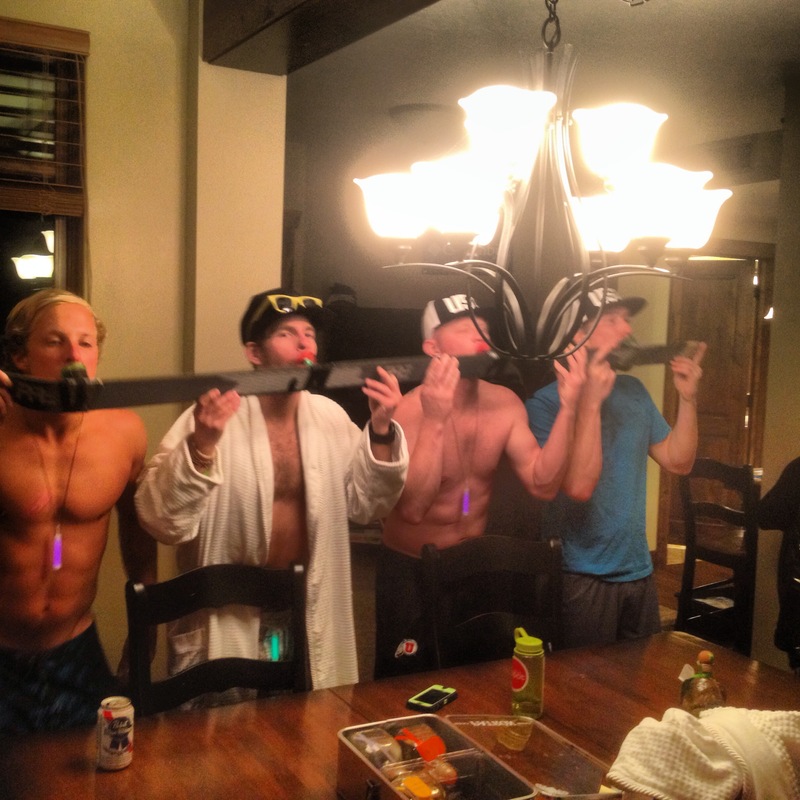 This is my kind of boarding. I like to get on the toe edge, and ride it to the bottom. I love speed. What I don’t love, is catching the toe edge while flying 40-50mph downhill. Which I actually did. About 200 yards from the lift on my 4th run, I caught the toe edge and went face down. Had my own theme music going and everything. I took a split second to make sure nothing was broken, jumped back up and continued to the lift. It wasn’t until I climbed onto the lift that I realized my snow pants were at my knees. I had completely BLEW UP the snap and the zipper came down. I felt like such a clown. We finished the downhill with somewhere between 8-9 runs each. On my last run, I decided to take it easy and carve a bit. No hurry now, the lifts were closed, the elevation was tracked, all we had to do was wait for the scores to be tallied. We grew as a team in just 2 days, we became closer friends, and I had an enormous amount of respect for all my competitors. We left the winter on the ground that day. 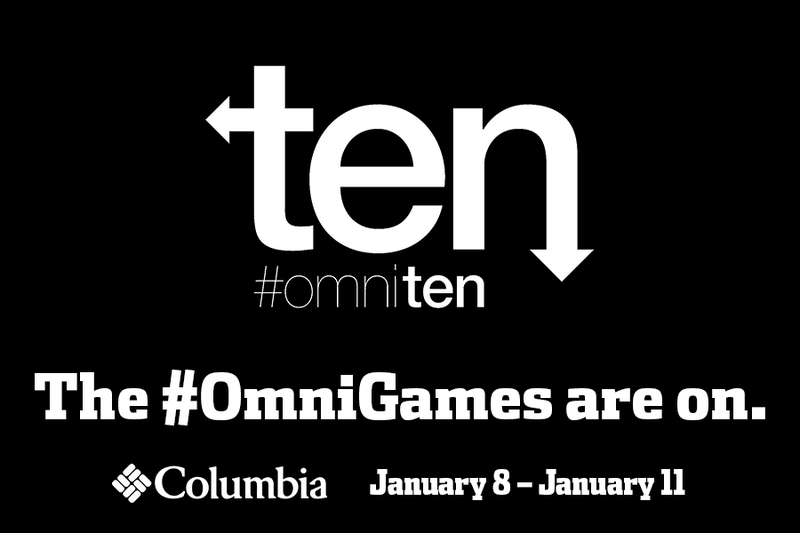 No matter what the results, we were part of the inaugural #Omnigames. And though when all is said and done, Katie and I might still be on the outside looking in. We might be sitting at #8 like we were before the Charles Dickens event started. But that would be ok. Don’t get me wrong, I want to go to Jordan extremely bad. But I can say this, we gave it our best shot, we left everything out on those courses and we gained a friend for life. I am so proud I was able to compete alongside such an awesome competitor. I really couldn’t have asked for a better teammate, and the truth is, without her we wouldn’t even had been in contention… Thank you Katie for being such an awesome teammate and friend. And thank you Jon and Heather for helping talk Katie through the ropes. You guys are the truth of what friendship is. I didn’t take a lot of photos, and I somewhat regret that now. I tried to live in the moment, and now I live with nothing but the memories. Memories of people I just met, people who have left a thumbprint on my heart, people I’ll never forget. 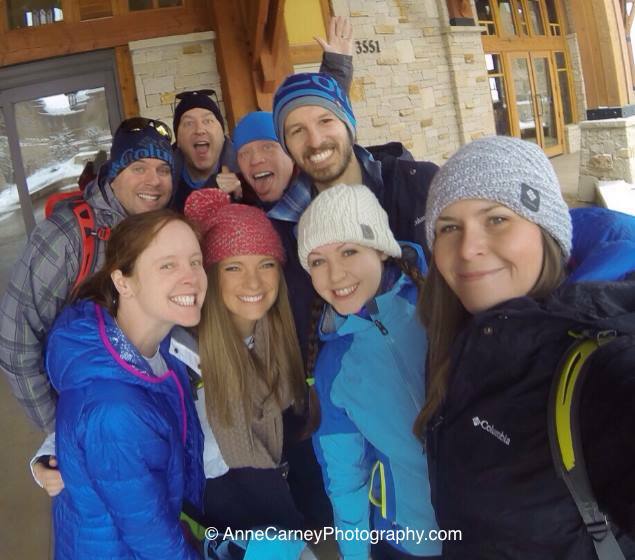 It’s amazing how Columbia Sportswear can bring together 10 strangers, or 30 strangers for that matter, and we make lifelong bonds. This week was truly epic, a time that will live in my mind as one of the best weeks of my life. I feel truly blessed to be a part of it, and to have met so many wonderful faces. After we found out what the challenges would be that we faced, a mix of excitement and nervousness began to build. I felt confident in all the physical challenges, just kind of nervous on the skills. And the entire first day was full of skills tasks. Being a bit hung over didn’t help matters. The #Insomnigames went into overdrive the evening before. Our group drew the task of snow mobile drive-by first thing. 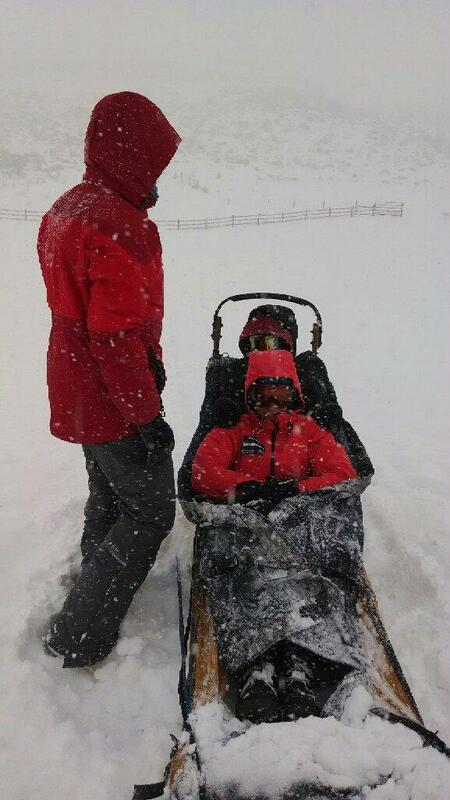 As we began to suit up with helmets and goggles, I asked my teammate Katie if she had ever driven a snow mobile before? The answer was an immediate no, and I replied that I too had never been on one before either. I asked if she was ok with me driving, she was fine with it (probably because she didn’t want to hurt my masculine ego). On the way out to the archery range, I told Katie she was welcome to drive the snow cat back, she was excited. Our group went through the archery event quite quickly, I failed miserably firing EVERY shot high. If not for my teammate Katie hitting the target a few times, we would’ve walked away with Zero points. So I would say she had earned the right to drive the snow cat back. And she rallied that thing, telling me it was ok to hold on as tight as I needed to. 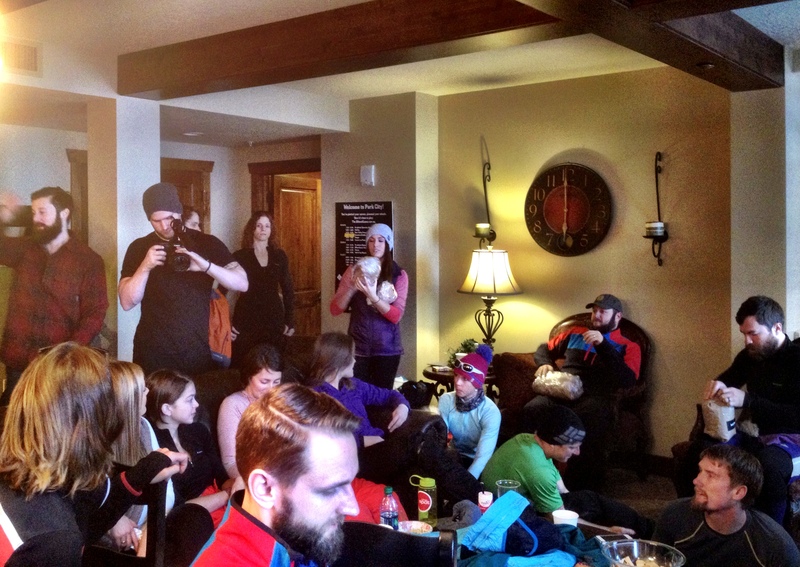 When we arrived back at the ranch, we found out it was our turn on the Hot chocolate run. We had to build a fire and a hut with only the supplies afforded us. We chose to build the fire first. If you’ve ever tried to build a fire in snow storm, you know it’s quite hard. But trying to build a fire with a magnesium block fire starter in the snow is almost impossible. I say almost, because 4 teams apparently accomplished this feat. We unfortunately were not one of them… The only thing I actually did accomplish was shaving part of my finger off, and swallowing an ounce of blood. As we snowshoe off to the next challenge, I had my head down. I was seriously disappointed with the way I personally had performed in the games thus far. I felt we needed a major rally during the Our house event. The hut building challenge was a timed event, so I knew we were against a wall. I wanted to get both our perspectives, but with a sense of urgency. Katie once again had some really good ideas with packing a snow wall to block the wind, and fill the holes. I thought a log crossed the top for secure structure, anchored to a couple of trees. We burrito wrapped the tarp over the log truss, and we used the strings to tie down the tarp. At the door opening, we shoelace tied the tarp together. It was nice and cozy, and would’ve worked great in a jam. I think we were pleased with our shelter building, but next we had the Needle in an Avalanche challenge. To find an object buried in the snow with an avalanche beacon. I had heard rumor that not many teams had done so good. So i saw this as a chance to gain ground. After a brief explanation of how the beacon worked, I felt we had a pretty good grasp on the situation. It only took us about a minute and a half to find the buried shoe, and the man in charge of the event said that our buried comrade would have lived. Although I thought we did a great job, there were quite a few teams who succeeded in less than a minute. So we were still somewhere in the bottom of the pack. After the beacon event, we were eating a delicious lunch, and I randomly heard the door open. I turned and saw a somewhat shy girl who looked a bit lost. 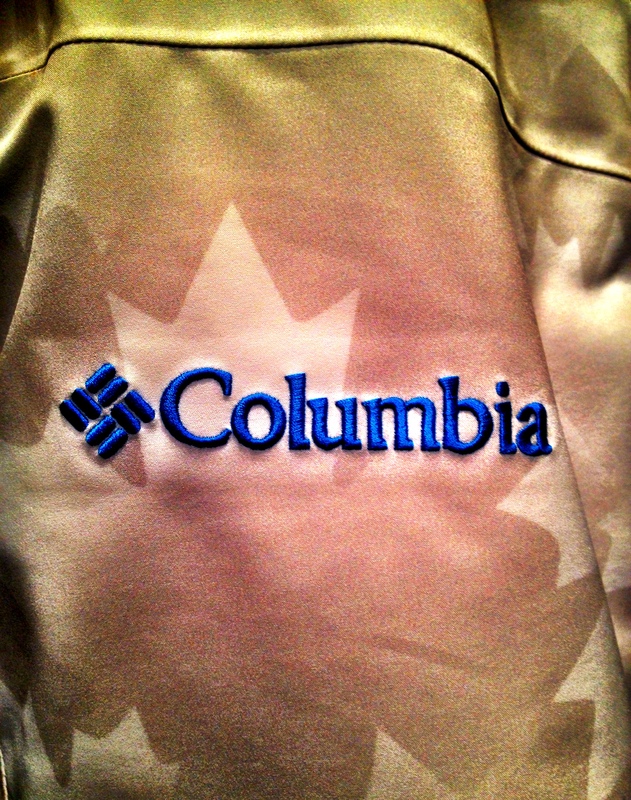 She was wearing a Columbia jacket, so I figured she was in the correct place. I began to turn around to finish eating, when it hit me like a snowball… THAT’S MICHELLE. S4’s long-lost teammate. She had finally made it. After many flight cancellations, delays and missed flights, she was there. We were all so happy to see that she made it. There were hugs all around. This girl was a trooper. Nothing was going to stop her from getting to Park City. Dog days of winter was the only event we had left that day. We were able to watch the musher hook up all the overly excited dogs. And we learned some of the history of dog sledding. Which was good, because this event was a memory based event. I believe we scored 100% on the quiz afterwards. And I have to say, we saved the best for last. 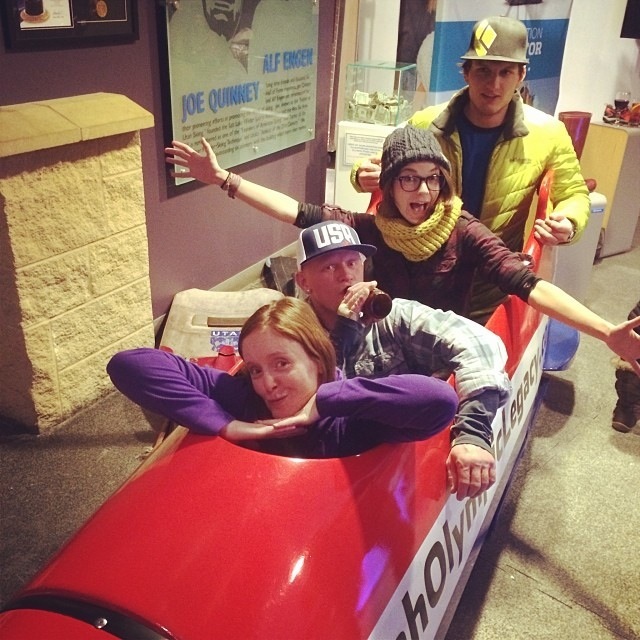 Riding in the sled was easily the most unique and fun thing I did while in Park City. Though the day didn’t quite go the way we had planned, I thought we finished it out nicely. Started slow, but Katie and I are strong finishers. And our strength events were still to come. We ended day one in 12th place of 15 teams, so we needed a perfect day 2. 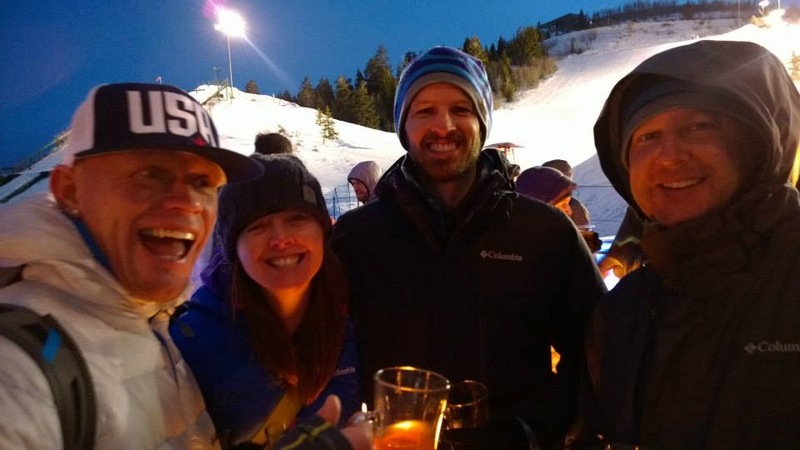 That evening, we all went to Deer Valley for dinner and the World Cup Mogul’s Competition. Now I’m not a skier, but I have to say, what an awesome resort, stylish and beautiful. I took this chance to get to know Michelle, riding the bus in the seat next to hers, and taking the lift up together. I had spoken to her briefly on twitter, but nothing would’ve prepared me for what an amazing person she is. Truly a friendship that I hope lasts forever. The most positive person I’ve ever met. That evening, drinking was off the docket. I wanted to be fresh and not hung over like the previous day. I needed to bring my A game. The #Omnigames were meant to be fun, but you take a bunch of competitive people and put us all in the area, its more like the Hunger Games. Lookout Below – This is a high ropes course 50′ off the ground. A test of balance, strength, agility and team work. Bridge the Gap – A shorter ropes course 25′ off the ground with problem solving, team work and balance testing. 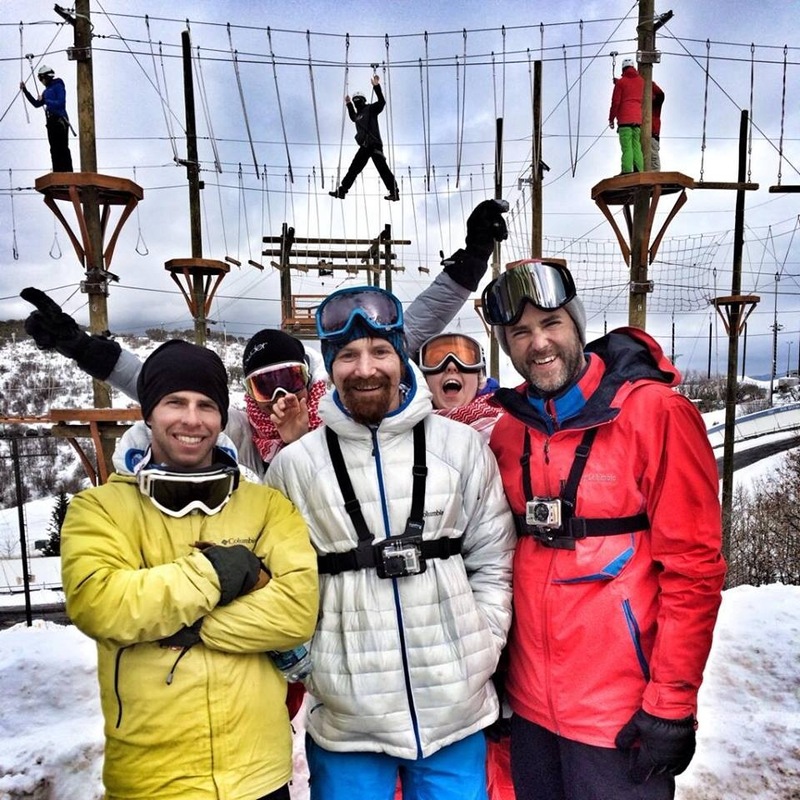 Leap of Faith – An almost 400′ zip line above the treeline, ending on top of a 65′ tower with one way down… JUMP. Downhill Derby – An hour and a half on the ski slopes, logging as much vertical elevation as possible. Charles Dickens – What you are currently reading. 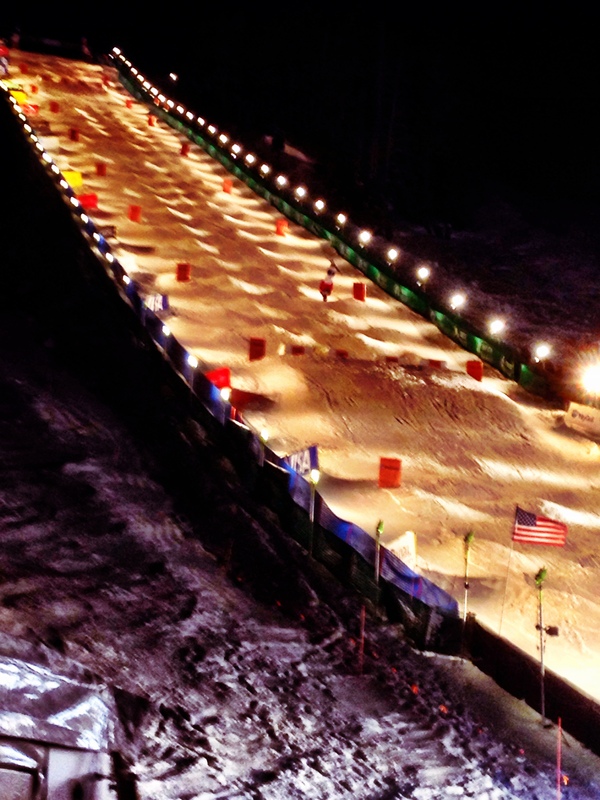 Our best attempt at writing, videoing, blogging our time at the #Omnigames. 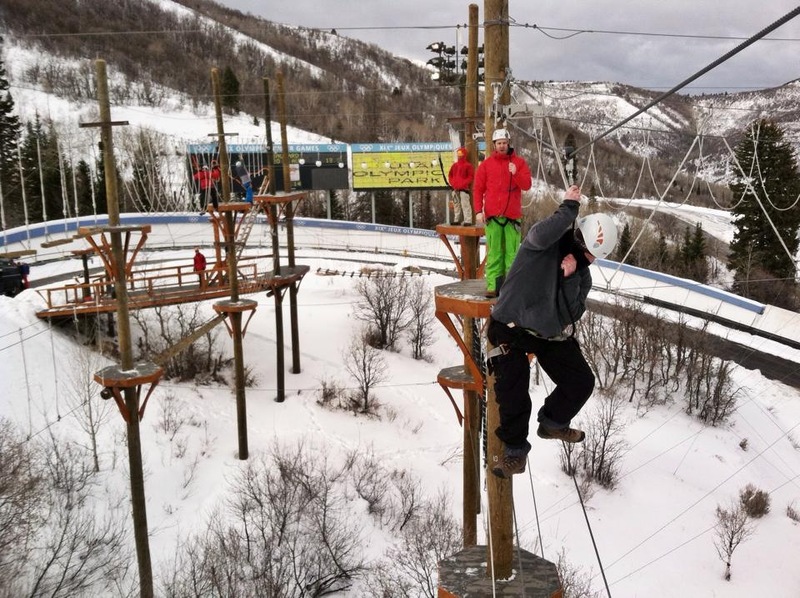 Please continue reading the next blog to find out how Katie and I finished the #Omnigames to this point… Suspense builder, Katie has a terrible fear of heights. 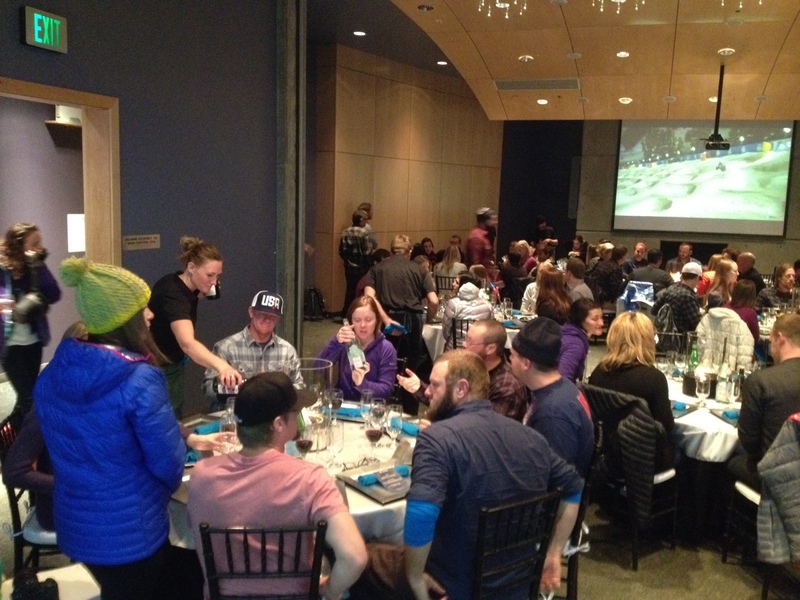 Most all the #Omniten members from every season were able to make the travel to Park City, few had other engagements. and some had travel nightmares rain down upon them. Needless the say, 75% of the playaz were there. 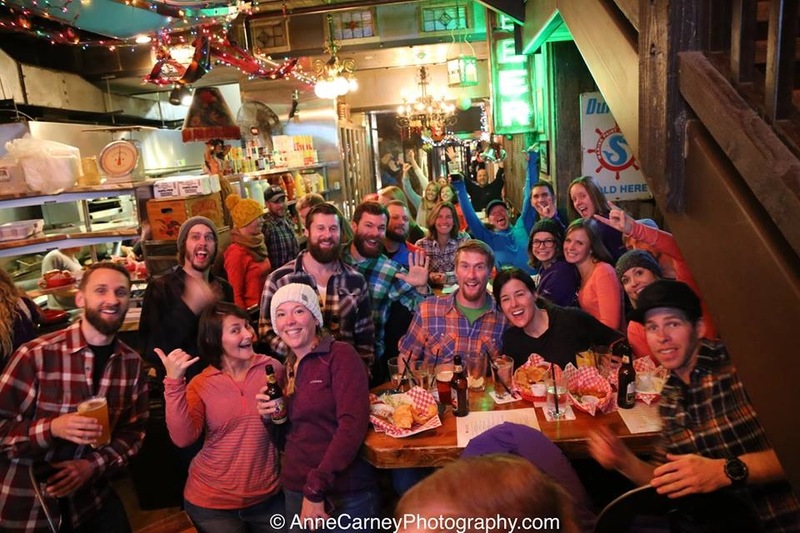 It began with everyone meeting at the No Name Bar on Main street. And Daniel telling everyone to move around and mingle, get to know your fellow #Omniten, not just the people from your season. There certainly was a reason for this. The evening was greeted with reunion hugs, hand shakes, and more hugs. Pictures after pictures, toasts and many smiles. It was so amazing to see all my old friends and making new ones, relationships that will last a lifetime. But after the bar, it was back to the hotel, back to bed for some. Early start the next day, hot tub time machine for others. After we all joined together in the hub for breakfast, in much anticipation, we waited to until 9am to find out what we were going to be doing. 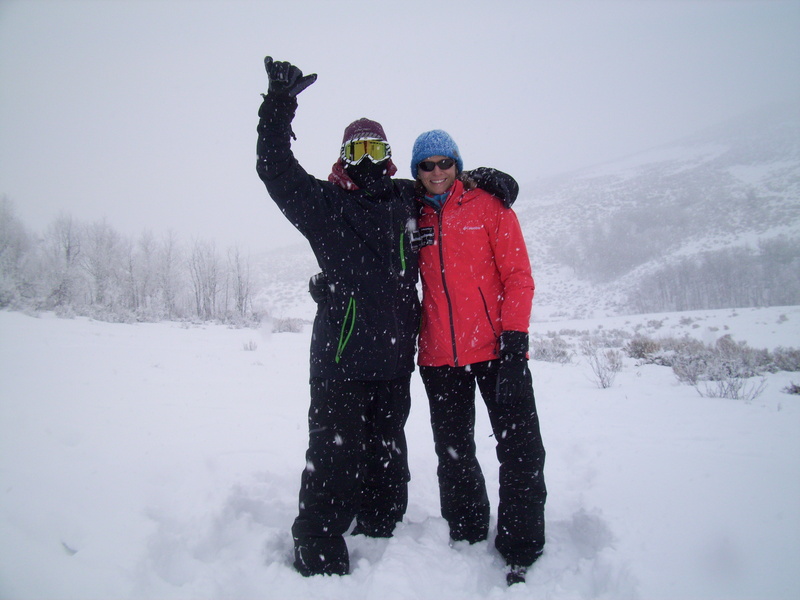 Daniel Green and Scott Trepanier explain to everyone how the #Omniten program was born, and that this was for “Life”, we would occasionally be invited along with Columbia Sportswear to be Trying stuff in different locations. And we would be getting free gear to test opportunely. 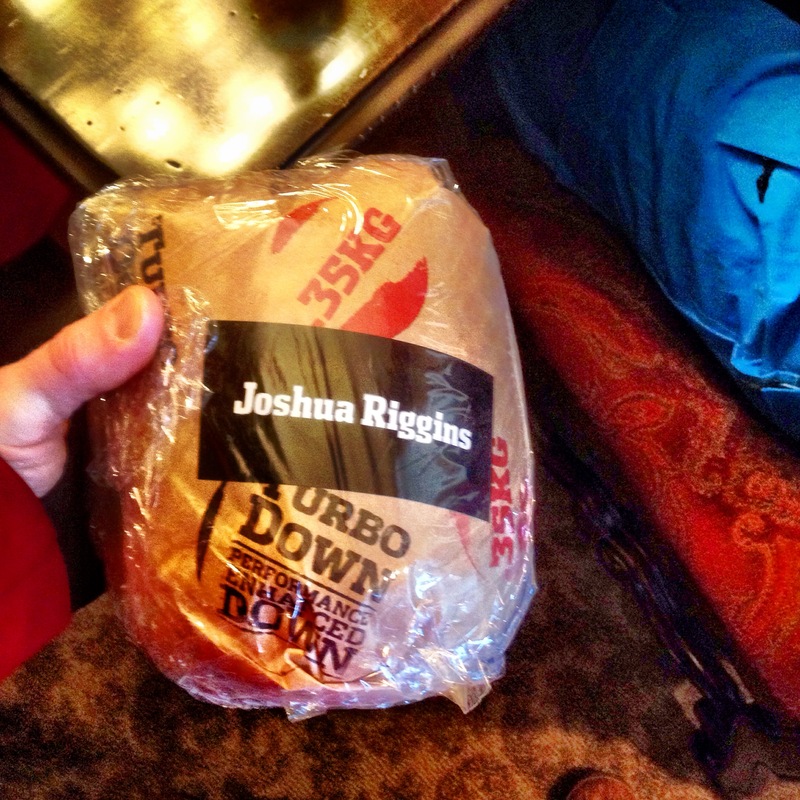 And if that wasn’t good enough, they gave each and every one of us a brand new Turbo Down Jacket to test. Not due in stores until September and they weigh less than 1 pound for the “Gold” level. using 550-fill down and Omni-heat technology on the inside. They will be nicely affordable at any budget, and are 8 to 22% warmer than current down jackets on the market. As soon as our little Christmas in January gift opening, we all piled onto the shuttles and made our way to an unknown ranch, where we were greeted by snow mobiles and dog sleds. And a lot of snow coming down. Our excitement increased ten fold. We went inside and the games had begun. Standing there listening to Daniel Green explaining the #Omnigames rules, I came to a realization. Everything I had done up to this point in my life has led me here. Every positive thing over the past few years, all the wonderful people I’ve had the pleasure of meeting, the hard work I had put in, learning, listening, watching, Trying stuff… I had found my people. It was unclear in my mind how I felt about competing against some of my best friends. You see, I’m a natural competitor. Inside every aspect of my life, I feel the need to compete. It is the fiber of my being. Although I longed to win the #Omnigames, I also felt a keen bond between the other competitors. And found myself rooting for them to do well. I mean, although I’m competitive by nature, I’m also a nurturer. I enjoy helping people. I was still under the impression it was going to be season vs season. And I have a love for many of the people on season 1. Boy was I wrong. The partner selection worked liked this. They split us into 2 groups: Fall & Spring. Then they picked a fall #Omniten to come up and draw a spring #Omniten member out of a hat. Thus the teams were born. 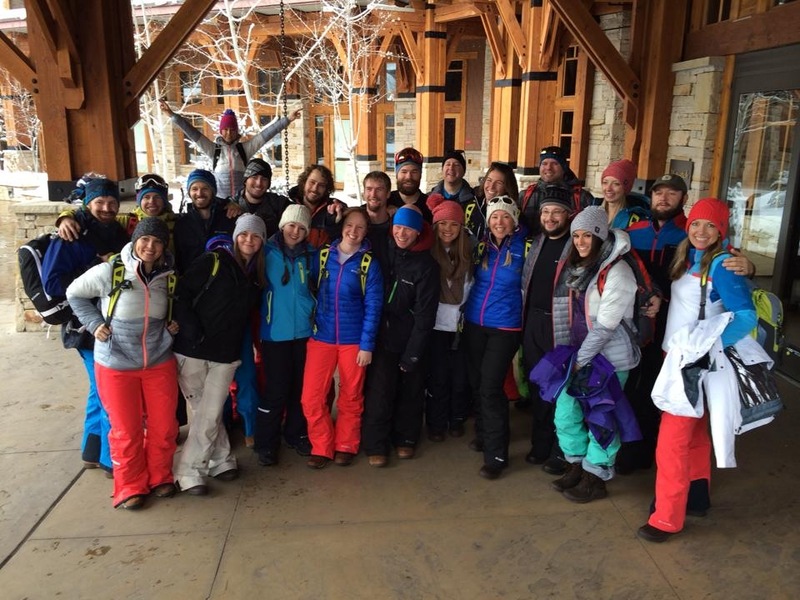 There are only 15 teams, because only 30 #Omniten members were capable of making it in time. It’s unfortunate for a few that the weather didn’t check with our schedules. Unfortunately, the first day was filled with skills that neither one of us ha any experience with. And barely any knowledge or know how. 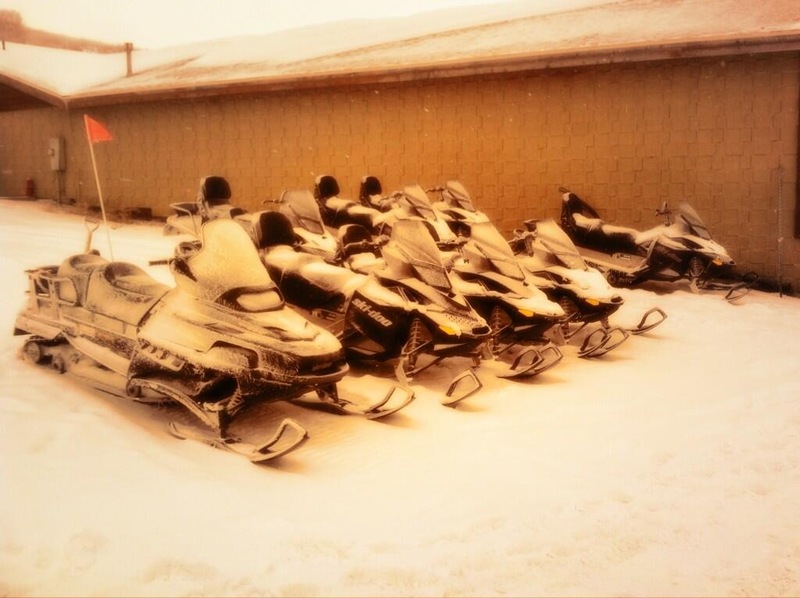 Having said that, I believe we did ok.
– Snowmobiling to an archery range, where we would have 4 shots at a target. Archery style. – Starting a fire with supplies given, boil water, and making hot chocolate within a certain amount of time. – Creating a shelter out of limited supplies given. – Avalanche scenario, using a Avy beacon to locate another beacon. 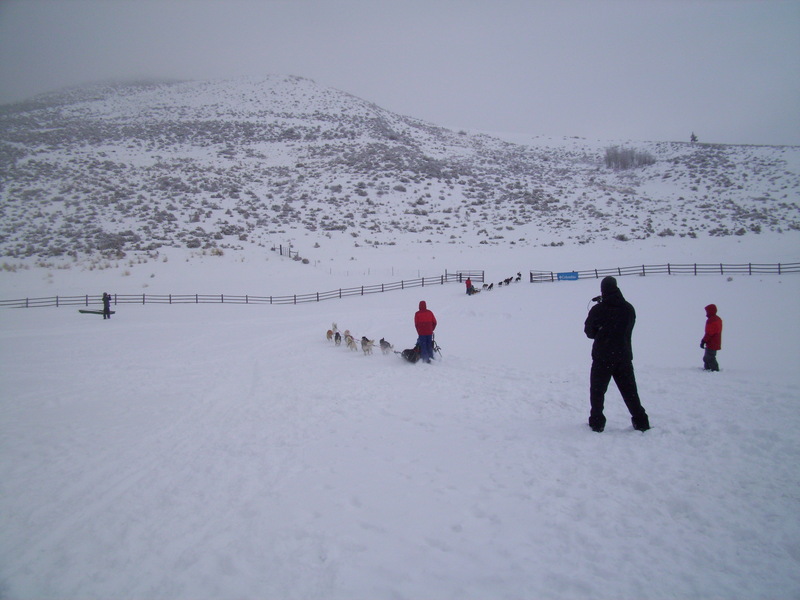 – Riding a dog sled and learning all about sledding, followed by a test of memory. If you want to find out what how we did on the challenges, please feel free to follow my blog and read again. I will be posting 2 more blogs before the week ends. And something special. 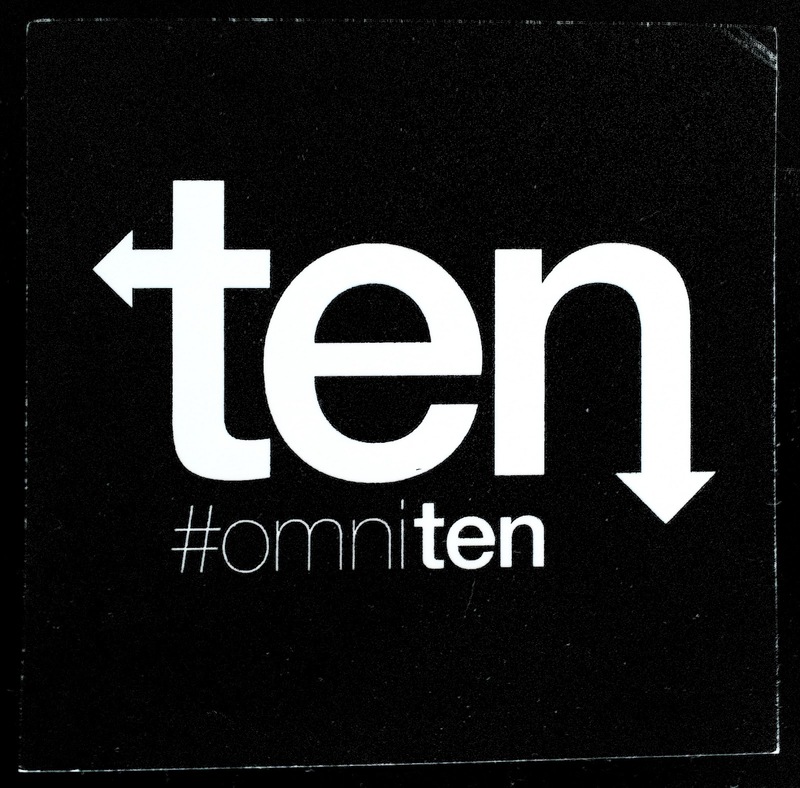 You can also check out the hashtags #Omniten or #Omnigames, or read one of the many other blogs by the #Omniten members. As I sit here reminiscing over the past year. I realize it’s been mixed with highs and lows. 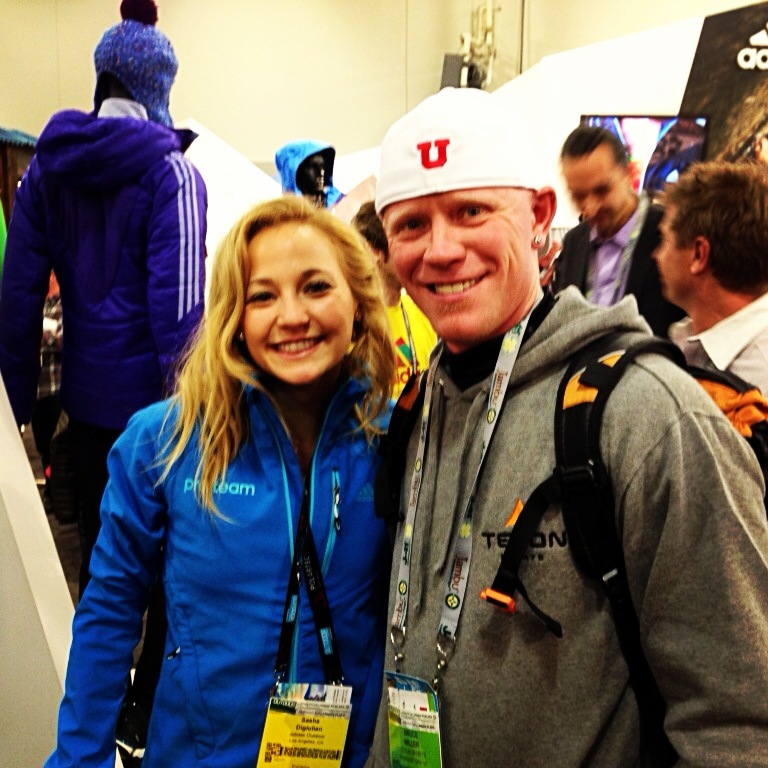 In January, I met one of my climbing hero’s Sasha Digiulian. This was very humbling to see such a tiny person that crushes. 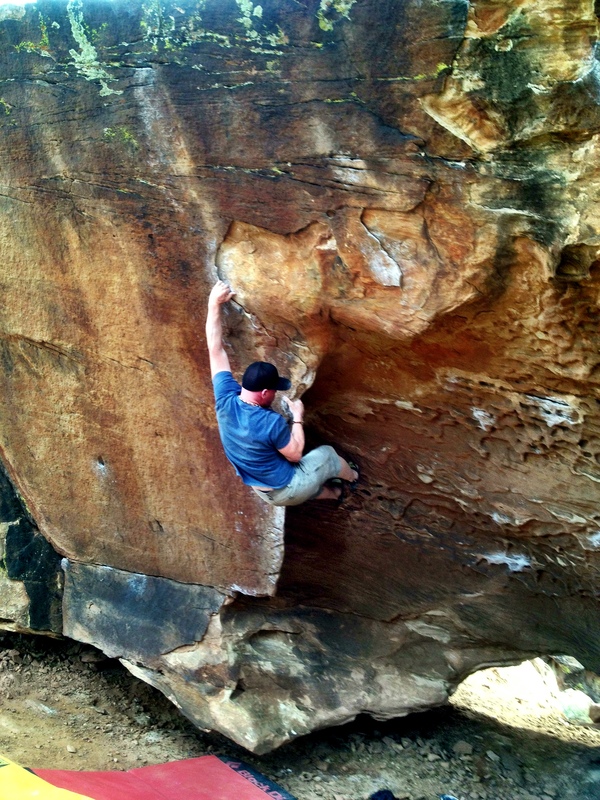 February, I sent 2 V-5 problems in Moes Valley. In march I had Hernia surgery. A month later, in April I rolled my bosses truck on the Interstate. 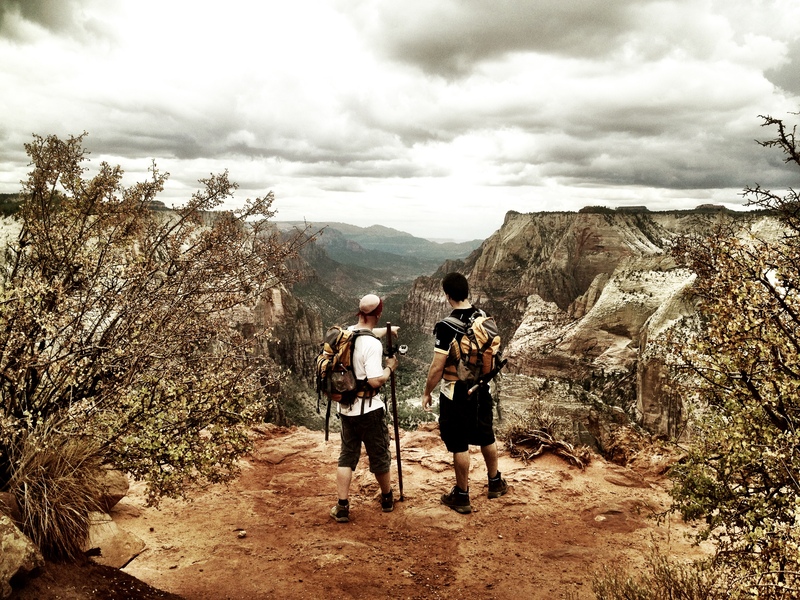 In the beginning of May I hiked into Havasupai. One of the highlights of the year. 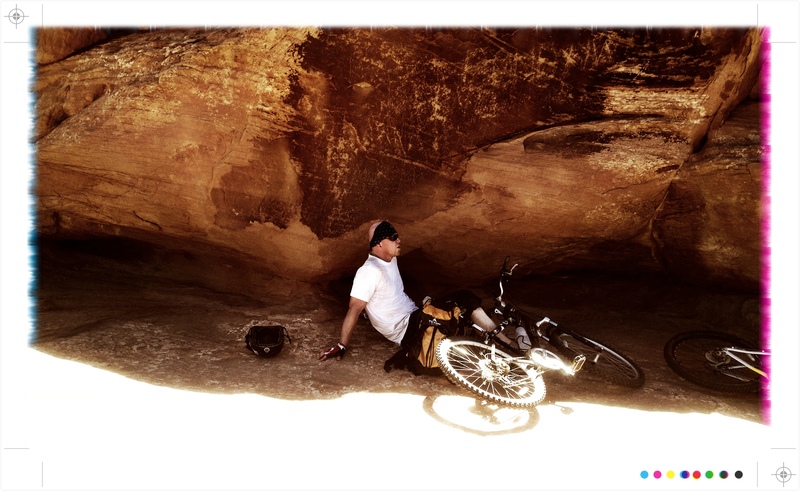 And in June I descended Blue John canyon (the famous “Ralston route”) and MTB for the first time in Moab. July was a good time, almost sending a 5.12B. And taking a great vacation with my boys. 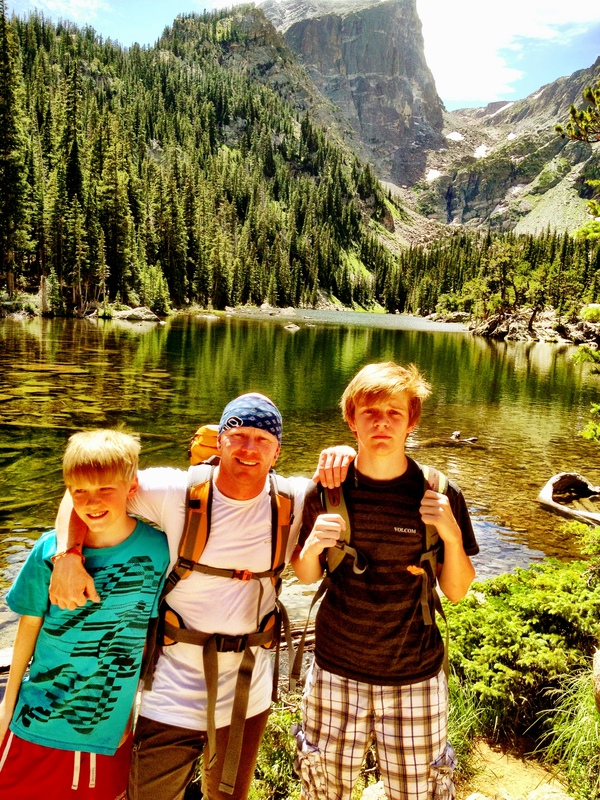 We hiked the Subway (though the water was murky), and spent time in RMNP. It’s the best time to get to know my boys on a personal level. August I was supposed to hike the Narrows, but the canyon flashed. So we were detoured to hike Observation Point (not a bad back up plan). 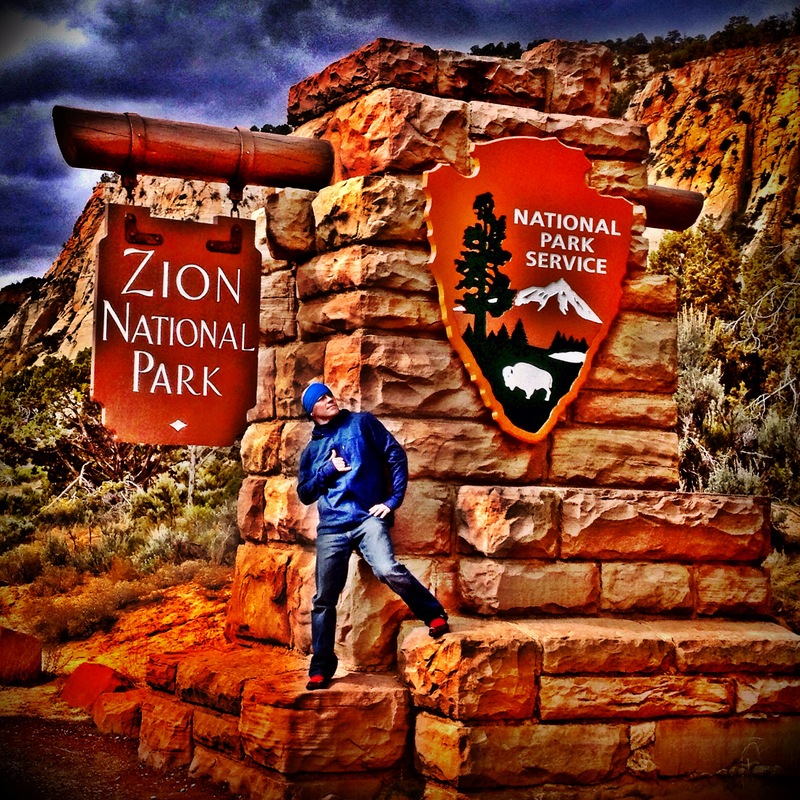 And we were dubbed the Zion Hooligans on that trip. I didn’t get outside much through September, too much work and many Utes football games. But I did manage to make a sunset hike to Lake Blanche with an awesome crew. In October, my luck changed for the good. 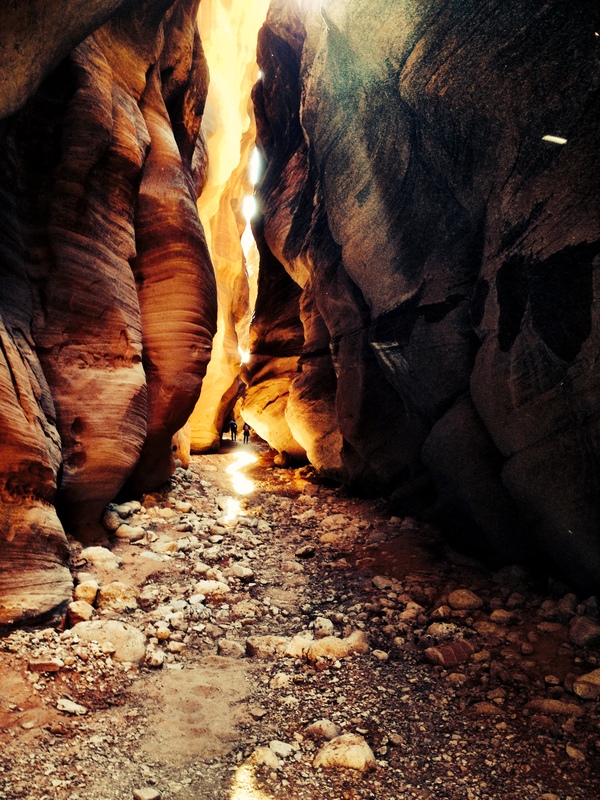 I received a Omniten invite, a #Terramartribe invite and hike Buckskin Gulch with a rad crew. I finished the last 2 months of the year quietly. Saving my PTO and working to get myself in a position to make 2014 an epic year. The only cool thing I did, was start volunteering to do charity work, and FINALLY getting my passport. So here’s to 2014, making new friends, achieving new goals and moving forward in life. Many of my goals for 2014 are already written down. Everything from building a woody in my garage, to staying in premium shape, to finally adventuring outside the US. I want to pay off most my bills and get debt free (minus house). Still need to hike the Narrows from top down, and want to send V7 outside. I need to re-roof my house, and I have already put money down to get a new tattoo. There are plenty of new places I long to visit in 2014, and many chores around the house I need to finish. Currently my list is about 30 different tasks, just over 2 a month. I believe I can achieve all of these… If the $$ is there. Do you have any advice in how you achieve goals? Do you have any goals you have set for 2014 that you want to share?